HomeMad as a lighthouse keeper? Mad as a lighthouse keeper? I was up in the North East over the weekend for a family wedding. 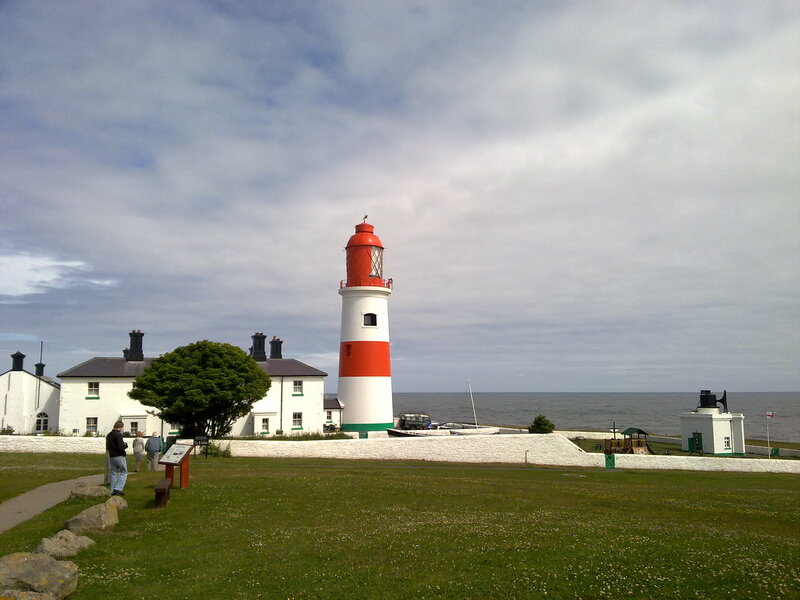 We stopped overnight and on the way home decided to visit the Souter Lighthouse at Whitburn. Opened in 1871 and operated until 1988, it is now owned by the National Trust. Standing in a dramatic location on the cliffs between the Tyne and Wear, it was the first lighthouse to be powered by electricity. After looking round the living quarters and the working areas of the complex we were able to climb the tower, accompanied by a guide. It was a steep climb up a spiral staircase and then an almost vertical ladder. According the NT website for the property, there are 76 steps – but it seemed like more! There was a good view of the coast from the top of the tower, but the main attraction for me was the lamp mechanism. 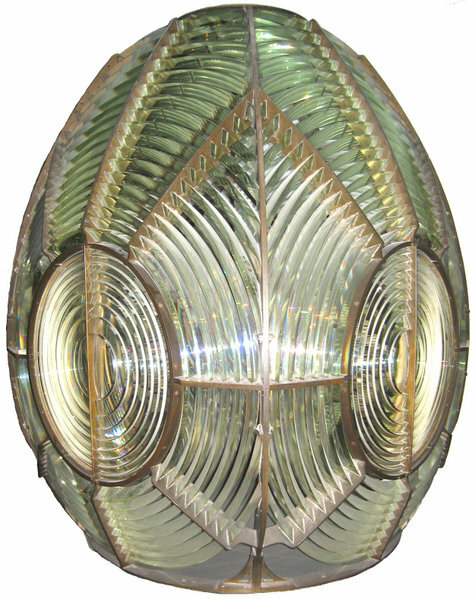 There are actually two fresnel lenses, one on top of the other. The beam from the lower lens was white while the upper one gave a red light. The whole lamp assembly weighs over four tonnes. It’s supported on a bath of mercury, one and a half tons of the stuff, which has two purposes. First of all it keeps the lamp perfectly level. Secondly it makes it easy to rotate the lamp assembly by reducing friction. We were able to prove this for ourselves by pushing it around with our fingers. Mercury, of course, is highly toxic, and the lighthouse keepers must have been exposed during their day to day activities, particularly when they had to remove impurities from the top of the bath and also when they had to periodically clean the liquid metal by passing it through a chamois leather, which they had to do every few months. Like most occupational hygienists I’m quite “sad”, I couldn’t help but wonder about what the lighthouse keepers were exposed to, so when I got home I did a search to find out whether anyone has done any work on tthis. I didn’t find much, just two relevant references. A study on airborne mercury concentrations in lighthouses along with evaluation of urinary mercury levels was carried out in a lighthouse in Canada in the 1980’s by van Netten and Teschke of the University of British Columbia (1). The results from the air samples ranged from 4.4 to 26.3 μg/m3. We don’t have a WEL for mercury in the UK, but the ACGIH TLV is 25 μg/m3 , so the survey certainly suggested that there was some risk that the TLV could be exceeded. Swabs taken on surfaces indicated that there was considerable accumulation of mercury on surfaces in the area of the light rotation mechanism, and other areas in the lighthouse. Urinary levels, however, were relatively low at <4 μg/24 hr urine. The authors of the study concluded that “mercury levels in this lighthouse appeared to be under control through effective convective ventilation and employee awareness“. I couldn’t find any other studies, but I wonder whether this was typical of lighthouses in general. Today, lighthouses are usually automated and there is much less risk of exposure. However, the levels reported in the study by van Netten and Teschke from the 1980’s were certainly of concern and it is likely that in the past exposure was even higher. We’ve all heard the term “mad as a hatter”, often attributed to the incidence of psychological effects due to mercury amongst workers in the hat manuffacturing industry. Perhaps “mad as a lighthouse keeper” is an alternative! ← What’s a “confined space”? The mercury bath was secured usually by means of paraffin oil film on top of mercury which prevented evaporation. Read the Split Rock Lighthouse report on mercury use in the lighthouse.The clockwork mechanism is still operated manually and it is viewed by thousands of tourists. Also look at St Augustine Florida. You should worry more about the mercury released into the atmosphere by crematoria and other sources! Hi Eileen. I think in the case you refer to it’s similar to Whitburn and the lighthouse is a museum. Clearly the exposure to mercury and associated risk visitors to lighthouses like this shouldn’t exceed exposure limits (8 hour averages) as concentrations are likely be low and their exposure time is very short. Although the visit to Whitburn started me thinking my discussion in the post is really about workers when lighthouses were manned, whose exposures would be quite different to museum visitors. Some tasks would have led to higher exposures and, of course, they were working and so exposed for considerably longer periods. I’m not actually saying that mercury exposures were necessarily a significant problem. Indeed, I quote one paper that notes “mercury levels in this lighthouse appeared to be under control through effective convective ventilation and employee awareness“. There isn’t a lot of data but of course this is now an historical issue as most lighthouses are automated these days. As for incinerators, well that would be more of an environmental exposure risk rather than an occupational one (which is what I was discussing), but I know there have been some concerns due to release of mercury from dental fillings. When the mercury became clogged with dust, dirt and other impurities it was the lighthouse keepers job to strain the mercury through a fine mesh. It would have been at this point that exposure to the poison would have been at its greatest.